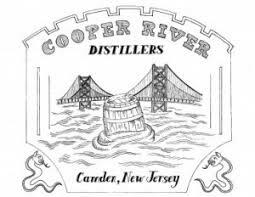 On it's website, Cooper River Distillers in Camden, NJ, plays up a sliver of land in the middle of the Delaware River, Petty's Island, as the namesake for its flagship rum. Although I have crossed the Delaware many times, I have never noticed an island. Similarly, I'm sure many people seek out Philly's craft spirit and beer scene without realizing there is a perfectly proficient distillery just across the river. 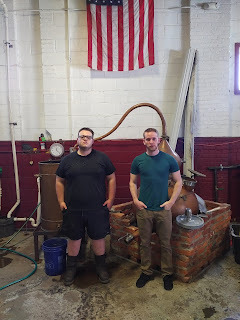 Ben, one of the distillers at Cooper River, is a bit apprehensive when I show up one Saturday morning. It's looking like he's going to turn me away. He says he is the only one there and he can't do a tasting. Clearly, wires are getting crossed somewhere. We end up chatting as Ben goes about his tasks. It gets noisy every now and again, but the place is small enough -think a hangar for a commuter jet; or better, the former auto body shop it was- for us to shout. Ben is not too long out of college and has a pretty interesting background. In his junior year, he took a class on Mesopotamian society. Part of what they covered was the centrality of brewing and fermented drinks to religious rituals. This was the rabbit hole that led Ben to Cooper River. The distillery had just opened up in 2014. The way Ben tells it, he wandered in one day and got the assistant distiller job. I'm sure there's more to it, but also don't want to start grilling my reluctant host right off the bat. Some time has gone by when the current assistant distiller, Andrew, comes in with lunch - bags of Hardees. Maybe all Ben needed was some food in him. Now, he is much more animated, holding court over the makeshift tasting bar. Rum is the name of the game at Cooper River. I try the signature Petty's Island first. It comes from a mash of Golden Barrel molasses, which Ben describes as "baking grade." 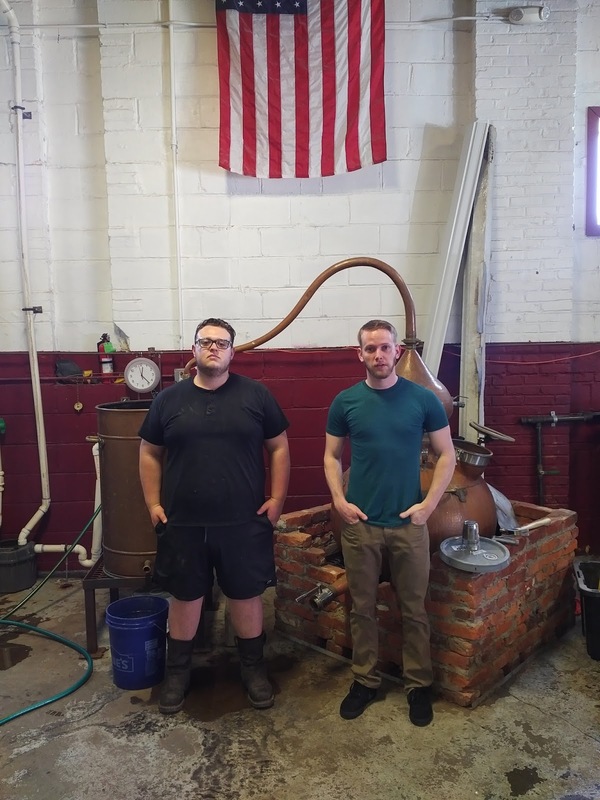 It takes two weeks to ferment, then gets distilled twice through their 80-gallon copper pot still. It gets bottled at 90 proof. The nose is earthy and sweet, like the best of molasses. The palate is also earthy, with just a hint of vanilla and caramel. Cooper River puts out an 80-proof spiced rum, which takes the Petty's Island white rum and infuses it with toasted applewood chips for four weeks. On week three, the Cooper River boys add cinnamon, ginger, vanilla, coffee, clove and allspice flavorings. The nose accordingly has notes of sweet apples and the rich, umami spices of bbq. The palate is deep coffee and vanilla, with just a bit of sweetness and finishing on some tart earth notes. I try a version of the Petty's Island rum that's been aged in used rye barrels for one year. This one is also 90 proof. It has a nose of spicey wood, that hides any sweetness or earthiness in the unaged rum. The palate also has been overtaken by time in the barrel, with lots of woody caramel and oak. It's not necessarily a bad thing, unless you specifically are looking for more of a rum flavor. Last of the rums, I try a 90-proof cinnamon-infused rum. It doesn't have much of a nose but the palate is of delicately sweet cinnamon. It's not overpowering in any way, which is a nice relief from other cinnamon-flavored spirits. Like those and the spiced rum, the cinnamon here comes from flavor extracts. Ben likes to distill craft beers, specifically a peach IPA and a Tuckahoe Brewing stout. I don't get to try the peach whiskey. Ben lifts the lid on a tub where the distillate from its stripping run is hanging out. It smells harsh with just an afterthought of peach. There's a musky moldy scent as well. Hopefully it tastes a lot better than it smells once it goes through its second run through the still. I do get to try the 87-proof stout derivative, which becomes a single malt after distillation. It is then aged for a year in a used rum barrel. It smells of sweet grass and citrus. The palate is a mild char, followed by a green pine finish. Ben and I somehow get around to discussing the value, or otherwise, of what we're taught in public school. I think it's because Ben's education touches so many different subjects. He not only aced that course in Mesopotamian beer-making, he has also studied political science and electrical engineering. The result -as is supposed to be the ideal of a liberal arts education- is he can not only hold an engaging conversation on a wide range of topics, but he can be thrown into a number of tasks without disastrous results. I tell him I'd be atrocious around distilling equipment, or anything requiring calculations and remembering instructions. Ben thinks about this for a bit. His approach is more about understanding the fundamentals of what he's doing - or the why of corn mash cooking at 170 degrees for an hour and a half, as opposed to simply memorizing the temperature and length of time, as most of us do with recipes. Amazing. I have often left a distillery with my head whirring - a generous combination of booze and information. Spending forty minutes or so with Ben is like adjusting lenses. I can now see the alcohol for the polymer chains, so to speak. I encourage a visit to Cooper River should you ever find yourself in either Camden or Philadelphia with an hour to kill. Just bring a couple hamburgers for the boys and watch them create.